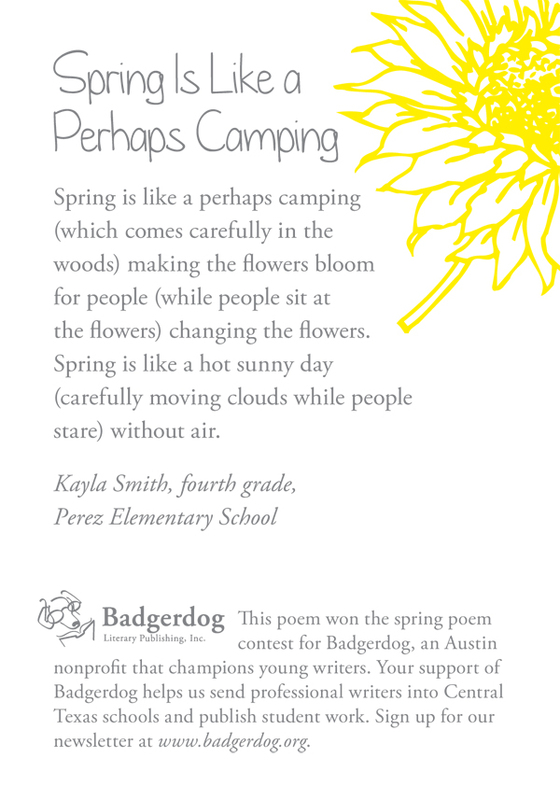 And now for the winner of our Spring Poem Contest: “Spring Is Like a Perhaps Camping,” a beautiful poem by Kayla, a fourth grader in Ms. La Touf’s class at Perez Elementary. Kayla wrote the poem as a response to reading and discussing e.e. cummings’ “Spring is like a perhaps hand” during her Badgerdog workshop with teaching-artist Claire Sylvester Smith. We’ve distributed poem cards with Kayla’s wonderful words at restaurants throughout Austin. We hope you’ll celebrate her words with us as we celebrate spring—and hope it will last a very long time and that summer is a long ways away! Here is a poem for today to continue our celebration of National Poetry Month. 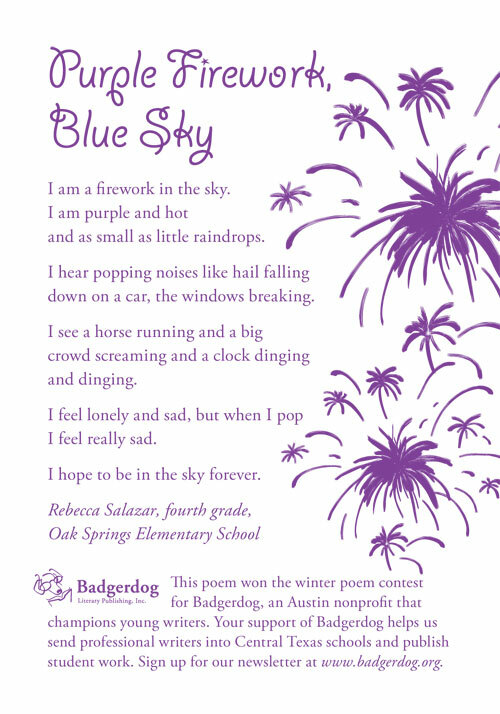 This poem, which is untitled, was another finalist for Badgerdog’s Spring Poem Contest and was written by Michelle, a fourth grader at J. J. Pickle Elementary. Michelle captures every detail of spring in her poem: animals running along with the wind, the beauty of rain, children playing outside, birds chirping, etc.—she leaves nothing out. Her poem has a unique rhythm to it that truly keeps us longing for more. I picked up a blooming fresh rose that was sitting in the wet green grass. It smelled like honey that was funny that I gave it money. The animals run in the breeze where the sun came out and where squirrels fed their babies that were jumping up and down. The birds chirp a beautiful melody while hawks glide through the smooth blue sky. When I walk through the park I see children playing with their friends and they soar when they play tag. The rain falls and it looks like clear blue dots falling from the sky with the dark, grey clouds. The animals hide and everyone goes inside while I look at the petals and leaves that were catching the water. To continue our celebration of National Poetry Month, here’s a poem from Kevin, a fourth grader at Perez Elementary. 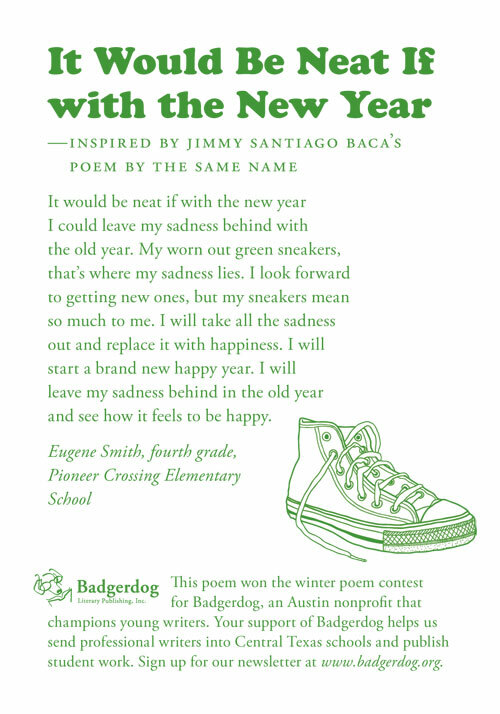 Kevin’s “A Waking, Walking Dream of Spring” was a finalist for Badgerdog’s Spring Poem Contest. In his poem, Kevin writes about a different type of spring, one where he finds unknown substances, creates a portal, and watches the outside world from a mysterious place. Kevin’s poem reminds us that springtime has that unique ability to transport us into our most vivid dreams, whether we are awake or asleep. to the other place, I can’t get out.